Those looking for a memorable holiday experience need look no further than Vietnam. A destination made famous by its history, breathtaking landscapes, incredible food and beautiful people. Hoi An Jeep Adventures has explored the length and breadth of the country, learning the stories behind the chronicled history and the local Vietnamese we meet along the way, allowing us to experience places and cultures largely untouched by tourism. Being based in the ancient port of Hoi An, famous for its laid back lifestyle, tailors and food culture makes us ideally positioned as a gateway into Central Vietnam. The sheer variety of landscapes is truly mind-boggling. A one day tour can see you driving through paddy filled coastal floodplains one minute and mountainous rainforests the next. In addition to the natural wonder of this country, the rich cultural history of central Vietnam provides a large number of man-made wonders to fill your eyes. From a humble farming hamlet to decaying battle sites and ancient ruins that have stood silent and strong throughout the ages. The weather in Central Vietnam can be a temperamental beast and you can expect varying amounts of rain and sunshine throughout the year, especially in the highlands. Having said that, the best time to travel to Hoi An, Hue and their surrounding areas is between the months of mid-January and late-August. During this time the weather tends to be quite dry and the temperatures average in the early 30s. The wet season rolls in around late September through to mid-December. At this time lowland flooding and inclement weather making exploration unimaginable – except by Jeep! Temperatures can get quite chilly in late December and early January so if you’re planning to travel then, make sure you pack a few warm clothes. With 54 ethnic minorities and a history that spans millennia, the people of Vietnam have a unique perspective on life and would love to share it with you. Hoi An Jeep Adventures takes you to them. From its beautiful coastline to the rugged interior, the sheer variety of landscapes in Vietnam will leave you thirsting for more and more. Hoi An Jeep Adventures delivers it to you on a plate. The ancient capital once housed royalty in its imposing citadel. Later, Hue found itself nearly destroyed in the American War. Hoi An Jeep Adventures can take you there in ways nobody else can. The war lasted a decade and left numerous scars on the Vietnamese countryside. Many have been redeveloped, some have been forgotten. 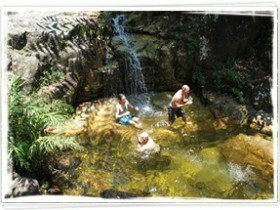 Hoi An Jeep Adventures have found the hidden gems. It is only relatively recently that many of Vietnam’s ethnic minorities have been accessible to the outside world. Sample their culture and way of life. Hoi An Jeep Adventures is a part of their community. The Hindu Kingdom of Champa once held sway over what is now Central Vietnam. Their legacy remains in the majestic ruins of My Son. Hoi An Jeep Adventures takes the long way ‘round. Made famous as the lifeline for Communist forces during the American War, the Ho Chi Minh Trail is one of the greatest roads on earth. Hoi An Jeep Adventures know it like no others. Hoi An has been an important port since the 15th century, when traders from China, Japan, India and Holland established shop houses on the banks of the Thu Bon river. The influence of these traders, and the French colonialists who followed, is still evident in the town’s architecture, cuisine and the importance of the river in the lives of local residents. The town’s famous covered bridge was built by Japanese traders, who believed its construction would slay a dragon that had its head in India, heart in Hoi An and its tail in Japan, and was responsible for earthquakes in Japan. 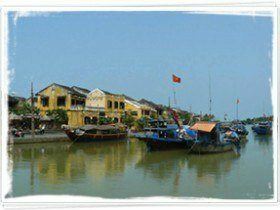 As the Thu Bon River began to silt up in the 19th century, the port was gradually overshadowed by nearby Da Nang. The town miraculously survived the ravages of the American War, and its remarkably preserved shop houses were declared as a UNESCO World Heritage site in 1999. The town is attracting travellers from around the world, who are drawn to the town’s famous architecture, fine dining and high-class tailors. My Son is a Hindu temple complex, located in the village of Duy Phú, in the administrative district of Duy Xuyên in Quang Nam province in Central Vietnam, 69km southwest of Da Nang, and approximately 10 km from the historic town of Tra Kieu. It comprises many Champa temples, in a valley roughly two kilometres wide, surrounded by two mountain ranges. It was the site of religious ceremonies for the Kings of the empire of Champa, and was also a burial place of Cham royals and national heroes. The My Son temple complex is one of the foremost temple complexes for Hinduism in South East Asia and is the premier heritage site of this type in Vietnam. Raising 693m out of the Eastern sea and covered with pristine rainforest, Son Tra Peninsula, or Monkey Mountain as it is also known brings natural beauty right to Da Nang’s doorstep. This largely undeveloped stretch of land was until quite recently solely the domain of the Vietnamese military due to its strategic value as the guardian of Da Nang harbor. With its pristine natural beauty and varied fauna and flora, Son Tra is a delight to ride around. 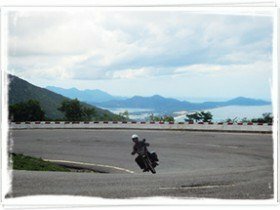 The sweeping and sometimes quite steep roads will see you riding higher than Hai Van Pass with the chance to glimpse rare monkeys and the certainty of seeing old growth forest. This highly panoramic road also passes highly significant American War era sites and the largest female Budha in Vietnam at the impressive Linh Ứng pagoda. 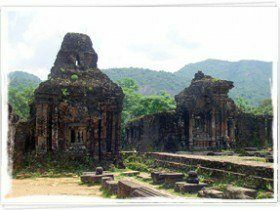 Just to the North of Da Nang and on the way to the ancient capital of Hue lies the infamous Hai Van Pass. The opening of the tunnel in 2005 has seen this winding road change from a riders nightmare into a riders dream, with all bar a few cars and trucks now taking the subterranean route. 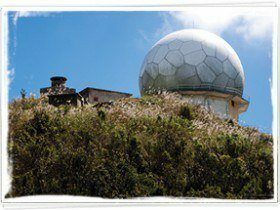 The view from the top is spectacular and an old French come American fort stands in silent witness to the pass’s important military history. 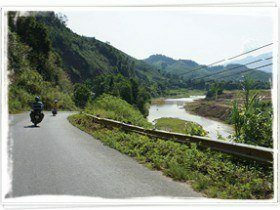 In 2008, the boys from Top Gear made this pass even more famous when they crossed over it in their Vietnam special. Richard Hammond’s choice of motorbike, one of Hoi An Motorbike Adventure’s Minsks served him well and lapped up the road with aplomb. Between our base in Hoi An and the booming port city of Danang lies Marble Mountain and China Beach. Known to the Vietnamese as Non Nuoc, which literally means “Our Country”, it was nicknamed China Beach by American GIs on R&R. This long stretch of beach offers views to the mountainous headlands North of Danang and the Cham Islands to the east. Just behind the beach, five rocky outcrops known as Marble Mountain have long been sacred to the Vietnamese and still serve as Buddhist temples. 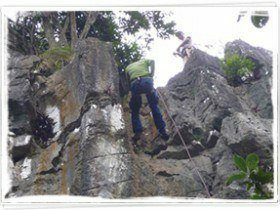 The mountains are the centre of the local stonemasonry craft and have recently been opened up for rock-climbing and abseiling. Those wishing for a taste of ethnic minority life in Vietnam are now welcome with the village opening its doors to intrepid travellers in 2013. A selection of stilted wood and rattan bungalows have been modernised to provide a comfortable experience and numerous traditional activities made available for those wishing for a unique getaway. 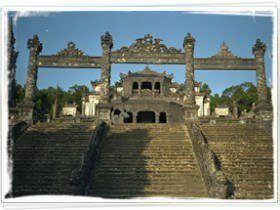 Hue originally rose to prominence as the capital of the Nguyen Lords, a feudal dynasty which dominated much of southern Vietnam from the 17th to the 19th century. In 1775 when Trinh Sam captured it, it was known as Phú Xuân. In 1802, Nguyễn Phúc Ánh (later Emperor Gia Long) succeeded in establishing his control over the whole of Vietnam, thereby making Huế the national capital. Huế continued to be the capital until 1945, when Emperor Bảo Đại abdicated and a Communist government was established in Hà Nội (Hanoi), in the north. While Bảo Đại was briefly proclaimed “Head of State” with the help of the returning French colonialists in 1949 (although not with recognition from the Communists and the full acceptance of the Vietnamese people), his new capital was Sài Gòn (Saigon), in the south. In the Vietnam War, Huế’s central position placed it very near the border between North Vietnam and South Vietnam. The city was located in the South. In the Tết Offensive of 1968, during the Battle of Hue, the city suffered considerable damage not only to its physical features, but its reputation as well, most of it from American firepower and bombings on the historical buildings as well as the now infamous massacre at Huế committed by the Communist forces. After the war’s conclusion, many of the historic features of Huế were neglected, being seen by the victorious regime and some other Vietnamese as “relics from the feudal regime”, but there has since been a change of policy, and some parts of the historic city have been restored. Phong Nha is a sleepy little town with absolutely stunning scenery all around. Famous for its caves and declared a UNESCO world heritage site in 2003, the town has seen a lot of change. It’s still sleepy and rural, though it now has an ATM and you can get pizza! The highlight however is the Phong Nha Khe Bang National Park, home to thousands of limestone caves (many yet to be discovered). The caves are the oldest in Asia, and archaeologists have dated them at around 400 million years old. The park is still tightly controlled by the military who closely guard access. The water in the rivers around the caves is so blue it’s scary and the caves are absolutely breath taking in size and magnitude.